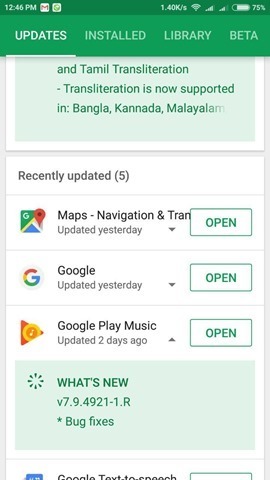 Google is adding a new feature to its Play Store app in Version 8.0. Before you ask what’s new in it? That is exactly what’s new in it, pun intended. The Play Store version 8.0 displays in-line change logs in the My apps and games page. That is the updates page in the side panel, as some people refer it to. The screenshot which you see above shows the “My apps and Games” page, and to the left of the update or open button, is a new drop down arrow. Tapping on this reveals the change log of the latest version of the app or game, which you select. This works for available updates, and recently updated apps. This of course depends on the developer or company actually providing the change log. Many do not include the details, and simply post bug fixes and improvements, as the change log, which is quite frankly useless. 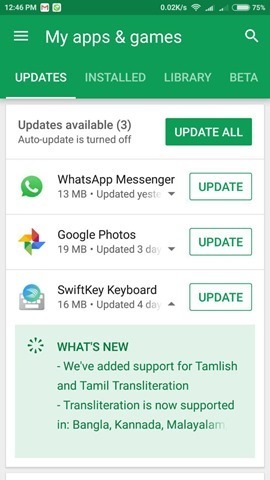 Some apps have the same change logs, like “we added new features”, etc which is equally bad. But for those apps where change logs are available, this is a real blessing. Google has been nailing it recently with the small yet very useful additions, to the my apps and games page. If you want to try the new feature on your device, download the Google Play Store v8.0 app update from APK Mirror.